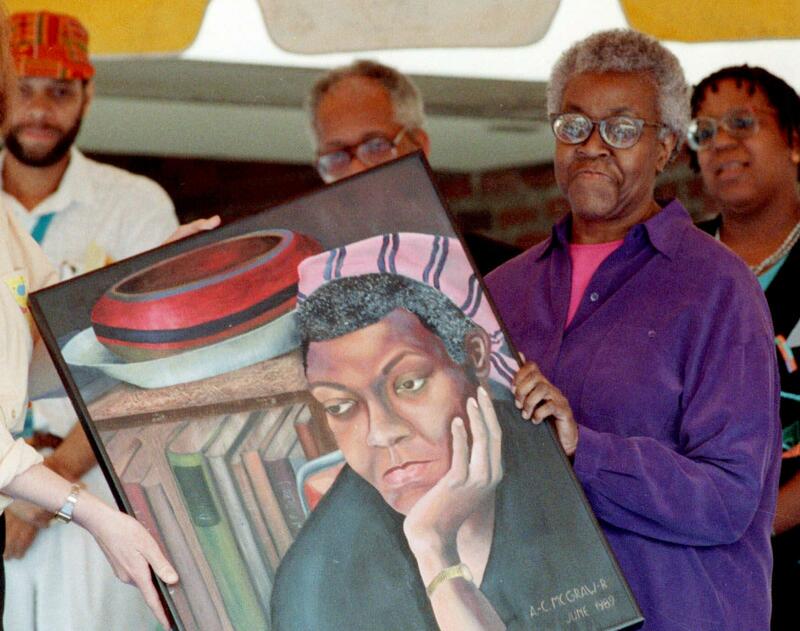 In this June 1989 file photo, Illinois Poet Laureate Gwendolyn Brooks holds a portrait of herself painted by Anne-Cressey McGraw-Beuchamp at a ceremony in Chicago. Brooks would have turned 100 on June 7. Illinois is commemorating her centennial all year with new books, poetry readings, exhibits, writing contests and a bus tour through her hometown of Chicago. She was the first African American ever to win the Pulitzer Prize, and first black woman inducted into the American Academy of Arts and Letters. She was only the second person to serve as Illinois Poet Laureate, succeeding Carl Sandburg. She was also the state's longest-serving laureate, an unpaid position she held for more than 30 years. Illinois is pausing this month to celebrate the life and work of this woman of firsts, who would have turned 100 on June 7. Brooks' poetic tableau included the people and activities she observed in the streets, alleys and backyards of Chicago's south side. Though she was born in Topeka, Kansas, she spent the rest of her life in Chicago, a city she loved and that loved her back. Still today, 17 years after her death of cancer in 2000, Chicagoans fondly refer to her as "Our Miss Brooks." Her poem "The Pool Players: Seven at the Golden Shovel" about a group of young men congregating in a pool hall is one of the most anthologized American poems of all time. It begins with the lines, "We real cool/ We /left school" and ends we the searing words "We die soon." Her daughter, the playwright Nora Brooks Blakely, says the poem remains as relevant a commentary on black urban life today as it was in 1959, when Brooks penned it and included it in an early collection called "The Bean Eaters." Blakely said her mother was an avid reader and "devotee" of newspapers and television news. The pulse of current events throbs throughout Brooks' work. "She looked at things very carefully, she observed well. In essence, she reported life back" to others, Blakely said on GLT's "Sound Ideas." "Her quote was that poetry is life distilled. She was doing a lot of distillation ." Brooks was a clear-eyed, always compassionate observer. In another of her famous poems, "The Bean Eaters," she writes tenderly of an elderly couple forced to eat simple fare because of their poverty. Brooks herself was no stranger hardship. On the day her Pulitzer Prize was announced, the electricity was turned off in her home because she couldn't pay the bill. By the time TV crews arrived the next day, the lights had come back on. Blakely said her mother never learned who paid the bill. "It was just one of those little miracles of the world." When money was tight, the family occasionally found itself in danger of losing the modest home on Evans Street that the Brooks' had purchased for $8,000. As a child, Blakely recalled, "I was eating far more meals of chicken wings and beans than I would have liked." Blakely said one of her mother's main contributions to the people of Illinois is the Poet Laureate's poetry contest she established for students from elementary grades through high school. 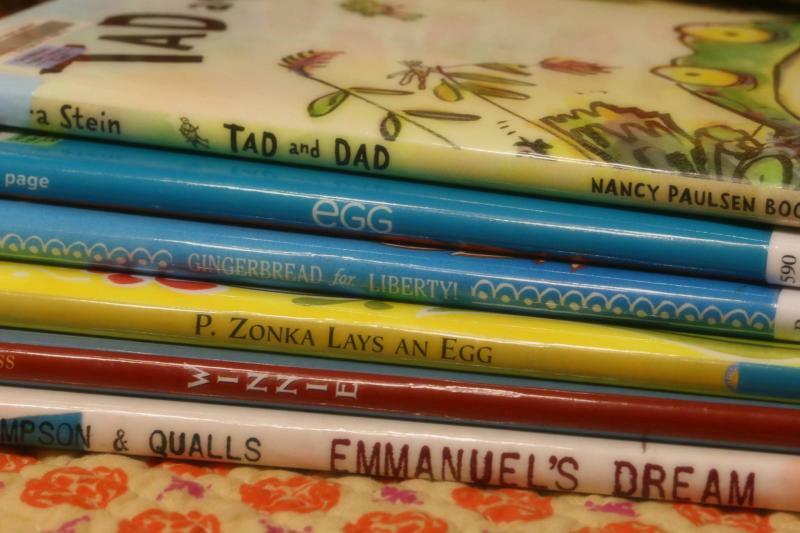 "We have over 30 years of children's writings from kindergarten to 12th grade that might not otherwise have existed," Blakely said. There were no outlined responsibilities for poet laureate before Brooks took over the job, Blakely said. Brooks essentially wrote the job description. "She did not feel comfortable having a title with no duties," her daughter recalled, even though the position, then as now, came with no salary. In the late sixties, Brooks became increasingly vocal and visible in the fight for civil rights and on other political matters, her daughter said. She influenced generations of young poets who followed her, and paved the way for the five African Americans who subsequently won the Pulitzer Prize for poetry. Blakely said her mother saw poetry writing as both a profession and vocation and continued to write nearly until the day she died. Brooks will be honored at a variety of events. On Friday, the University of Illinois in Urbana, will open an exhibit of her personal items and papers at the Poetry Foundation in Chicago. Brooks' papers are stored in the rare books collection at the university's library in Urbana. To mark her centennial, Harper Collins has released a children's book called "We Are Shining," based on the Brooks work, "A Little Girl's Poem." 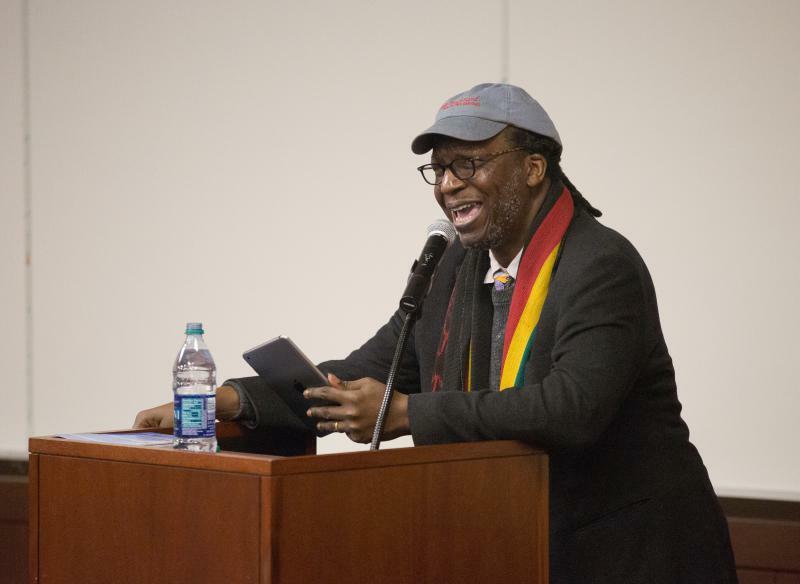 Brooks Permissions, dedicated to preserving the poet's work, has published a new collection of the poet's work titled, "Seasons: A Gwendolyn Brooks Experience." The collection contains a previously out-of-print guide Brooks wrote decades ago for young poets. In it she advices, "Tell the truth as you know it. Don't try to force your poem to be nice or proper or normal and happy if it doesn't want to be." Listen to Gwendolyn Brooks reading her poem, "The Pool Players." There were few books in Cornelius Eady's household when he was growing up in Rochester, New York. "We barely had a radio," he recalled on GLT's Sound Ideas. First Book McLean County wants to put books into the hands of area at-risk children, and the organization hopes their upcoming fundraiser will fill shelves with Harry Potter, Nancy Drew and The Cat in the Hat.